This is a special offer for sole practitioners licensed between 2010 and 2018. 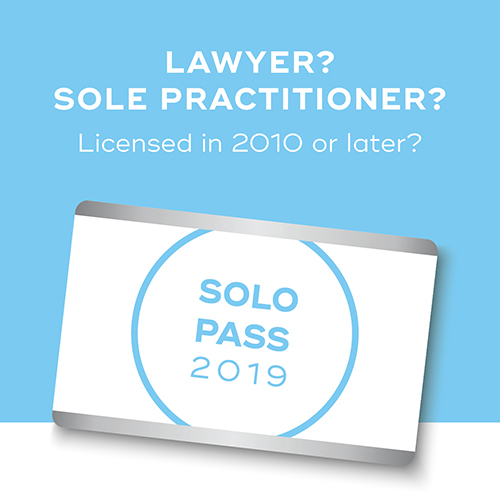 The 2019 Solo Pass for Lawyers is on sale until June 3, 2019. To purchase a pass, please call 416-947-3315 or 1-800-668-7380, ext. 3315. Passes are non-refundable and non-transferable. They cannot be combined with a bursary or any other discounts. Programs purchased as part of the 2019 Solo Pass for Lawyers must occur between January 1, 2019 and December 31, 2019. Please note that there is an extra step to register for the 14th Solo and Small Conference (buying a pass does not automatically register you to attend). To register for the conference, please contact the CPD Registration Team at 416-947-3315 or 1-800-668-7380, ext. 3315.